(Nanowerk News) Catalysts that power chemical reactions to produce the nylon used in clothing, cookware, machinery and electronics could get a lift with a new formulation that saves time, energy and natural resources. 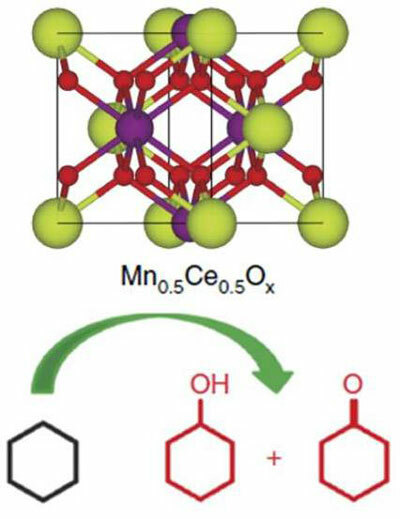 The catalyst developed by researchers at the Department of Energy's Oak Ridge National Laboratory and highlighted in a paper published in Nature Communications ("Mesoporous MnCeOx solid solutions for low temperature and selective oxidation of hydrocarbons") features unprecedented selectivity and a conversion rate nearly twice that of conventional catalysts. Selectivity refers to the ability to target a specific chemical bond. It is also significant that the catalyst can break the carbon-hydrogen bonds in hydrocarbons such as cyclohexane, the precursor of nylon, without using noble metals. This has been considered a bottle-neck step in the production of nylon. "The greater the selectivity, the more products that can be derived," said ORNL chemist and lead author Sheng Dai of the Chemical Sciences Division. "The catalyst is the main ingredient to speed up desired chemical reactions, and we have created one for synthesizing the nylon precursor that is especially effective at activating the carbon-hydrogen bonds." ORNL's successful approach lies in the formation of an ultrahigh concentration of active sites - for breaking the carbon-hydrogen bonds -- from a 50-50 atomistic mixture of manganese oxide and cerium oxide. This creates a catalyst that is extremely porous and features a high surface area, making it efficient at breaking these bonds. The high efficiency, or conversion rate, of the ORNL catalyst means more nylon can be produced from cyclohexane in less time. Dai emphasized that this success was a team effort as he enlisted the help of ORNL postdoctoral research associate Pengfei Zhang, visiting scholar Hanfeng Lu of Zhejiang University and others to test his concept. "Our catalyst has created a sustainable way to prepare complex mesoporous metal oxides and demonstrates outstanding performance in the selective oxidation of various hydrocarbons by oxidation," Zhang said.